Missing teeth can leave you feeling like you’re missing out on things you used to enjoy and do with ease and confidence. Talking, eating, and even smiling can be difficult or leave you feeling embarrassed about the state of your dental health. At Fort Bend Periodontics and Implantology, Dr. Dyer and his team can replace your missing teeth with dental implants. We can provide you with full dental implants from start to finish here in our Sugar Land dental office and we work hand in hand with your general dentist, so you’re sure to end up with a beautiful and fully functioning smile. Implant dentists and patients alike prefer dental implants when it comes to tooth replacement. They are a permanent replacement option for any number of missing teeth and allow your dentist to provide you with new teeth that look and feel great. The Implant: a small titanium post that is surgically placed into the jawbone in place of a missing tooth. The Abutment: the connecting piece that fits securely on top of the implant. The Restoration: the tooth-like piece that sits above the gum line: typically a dental crown, bridge, or denture. If we determine that dental implants are right for you, we’ll work closely with you and your general dentist to design the look of your implant restoration and make sure that the fit is just right. We generally recommend a dental crown or bridge for single-tooth implants, a bridge to replace a few teeth in a row, and a denture when most or all teeth in an arch are missing. Before beginning your dental implant journey, we will bring you in for a consultation. During this appointment, our team will take X-rays of your teeth and jaw, looking particularly at the condition of your jawbone to ensure that it’s strong enough to support an implant. If it isn’t, we can perform a bone graft. We’ll also go over your needs and dental health. We’ll make a restoration recommendation and create a personalized treatment plan. When it’s time to begin your treatment, we’ll start by placing the implant or implants into your jawbone surgically. Once placed, the titanium post will begin to fuse with your jawbone. The process takes a few months, and we can check it using X-rays. 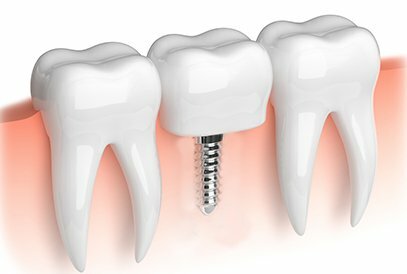 Once the implant has fused with the bone, it will serve as a secure and strong replacement tooth root. Then we’ll work with your general dentist to complete the restorative phase. And at your final appointment, we’ll check your implant inclusion. Patients missing most or all teeth in an arch or who currently wear ill-fitting or uncomfortable dentures may benefit from mini dental implants and an implant supported dentures. With this procedure, we strategically place four to six mini dental implants in the jawbone. We then either create a new denture that has holes corresponding to the placement of the implants, or we can drill holes in your existing denture. Instead of using messy adhesives to keep your denture in place, you simply click the denture into place on top of the mini implants. 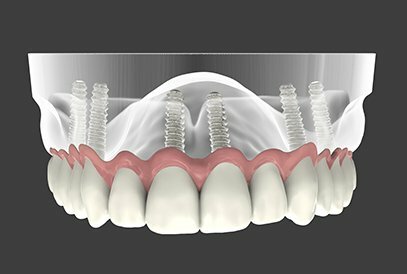 You’ll find that your implant supported denture stays more firmly in place, making it more comfortable than before. After each stage of your dental implant procedure, we will provide you with detailed post-op instructions, but if you ever have any questions or concerns, don’t hesitate to contact us. Over-the-counter pain medications can help alleviate any post-op pain, and intermittent icing can reduce any swelling. Once your restoration is in place, you can think of your implant as just another tooth. It needs the same amount of care, so be sure you have a good dental hygiene routine in place and make regular appointments for dental check-ups. Just like your natural teeth, your dental implants will last longer when you take good care of them. Each patient’s treatment plan is unique, making the cost of dental implants different for everyone. During your first visit with us, we’ll go over your treatment and provide you with a precise cost breakdown. When it comes to paying for treatment, we do everything we can to make dental implants affordable. Our office is insurance friendly and we offer a variety of payment plans through CareCredit® and LendingClub®. Please speak with a member of our team to explore your financial options.